Day 1 – 8 x 400 meter repeats @ current pace. Recover between each repeat with 2 minutes of passive recovery. Then run 2 x 400 meter repeats @ goal pace. Recover between each repeat with 2 minutes of passive recovery. Day 2 – 10 kilometer fartlek run. Day 3 – 3 x 2400 meter repeats @ 5K pace. Recover between each repeat with 4 minutes of passive recovery. Day 4 – Run 12 kilometers @ easy pace. Day 5 – 8 x 200 meter repeats @ 400 meter pace. Recover between each repeat with 1 minute of passive recovery. Day 6 – 5K to 10K fartlek run or rest. Day 7 – 4 x 200/400/200 compound sets. Run 200 meters @ 800 meter pace, 400 meters @ current mile pace and then another 200 meters @ 800 meter pace. Take no recovery between the distances. Recover between each set with 4 minutes of passive recovery. Day 8 – Run 12 kilometers @ easy pace. Day 9 – Run 4 x 400 meter repeats @ current mile pace. Recover between each repeat with 2 minutes of passive recovery. Then run 4 x 200 meter repeats @ 800 meter pace. Recover between each repeat with 1 minute of passive recovery. Then run 4 x 100 meter repeats @ sprint pace. Recover between each repeat with 30 seconds of passive recovery. Day 10 – 10 kilometer fartlek run. Day 11 - Run for 18 minutes alternating between 1 minute @ mile pace and 2 minutes @ easy pace. Then run 10 x 100 meter strides. Day 12 – 5K to 10K fartlek run or rest. Day 13 – Run 10 x 100 meter repeats up a steep hill. Run @ current pace. Recover by running down the hill @ easy pace. Day 14 – Run 12 kilometers @ easy pace. Day 1 – 5 x 400 meter repeats @ current pace. Recover between each repeat with 2 minutes of passive recovery. Then run 5 x 400 meter repeats @ goal pace. Recover between each repeat with 2 minutes of passive recovery. Day 3 – 3 x 2400 meter repeats @ 5K pace. Recover between each repeat with 3 minutes of passive recovery. Day 4 – Run 10 kilometers @ easy pace. Day 5 – 10 x 200 meter repeats @ 400 meter pace. Recover between each repeat with 1 minute of passive recovery. Day 7 – 4 x 800/400 compound sets. Run 800 meters @ current pace then another 400 meters @ 800 meter pace. Take no recovery between the distances. Recover between each set with 4 minutes of passive recovery. Day 8 – Run 10 kilometers @ easy pace. Day 9 – Run 4 x 400 meter repeats @ current mile pace. Recover between each repeat with 1 minutes of passive recovery. Then run 4 x 200 meter repeats @ 800 meter pace. Recover between each repeat with 30 seconds of passive recovery. Then run 4 x 100 meter repeats @ sprint pace. Recover between each repeat with 15 seconds of passive recovery. Day 11 - Run for 24 minutes alternating between 1 minute @ mile pace and 2 minutes @ easy pace. Then run 10 x 100 meter strides. Day 13 – Run 12 x 100 meter repeats up a steep hill. Run @ current pace. Recover by running down the hill @ easy pace. Day 14 – Run 14 kilometers @ easy pace. Day 1 – 2 x 400 meter repeats @ current pace. Recover between each repeat with 1 minute of passive recovery. Then run 8 x 400 meter repeats @ goal pace. Recover between each repeat with 1 minute of passive recovery. Day 3 – 3 x 2400 meter repeats @ 5K pace. Recover between each repeat with 2 minutes of passive recovery. Day 5 – 12 x 200 meter repeats @ 400 meter pace. Recover between each repeat with 1 minute of passive recovery. Day 7 – 4 x 800/400 compound sets. Run 800 meters @ goal pace then another 400 meters @ 800 meter pace. Take no recovery between the distances. Recover between each set with 4 minutes of passive recovery. Day 9 – Run 4 x 400 meter repeats @ current pace. Recover between each repeat with 30 seconds of passive recovery. Then run 4 x 200 meter repeats @ 800 meter pace. Recover between each repeat with 15 seconds of passive recovery. Then run 4 x 100 meter repeats @ sprint pace. Recover between each repeat with 10 seconds of passive recovery. Day 11 - Run for 30 minutes alternating between 1 minute @ mile pace and 2 minutes @ easy pace. Then run 10 x 100 meter strides. Day 13 – Run 12 x 100 meter repeats up a steep hill. Run @ goal pace. Recover by running down the hill @ easy pace. Day 14 – Run 16 kilometers @ easy pace. My current VO2max is 71.07ml/kg/min. Marathon-3:46 hours/minutes possibly in 2 hour range now. 10K-29:57:59. Possibly in 28 minute range now. 100m-11.7 seconds. The .7 may be inaccurate, I used a stop watch. Heart Size-19% larger than normal. The doctor found this under an MRI scan, and thought that I had abnormally, unhealthy heart hypertrophy, but it turned out it was as a result of exercise. Weight-108 Ibs. lost another 3 lbs from 107. My first timed mile 7:21 in 6th grade, around 1 hour of *real* intense physical activity a week. Haven't been on teams, or anything else. So who am I, how did I get in the sport of running, and my future plans. I was born on August 26th, 1992. I am 17 years old now. I was born in Atlanta, Georgia and named as Dan. However, my real name is Angelo from my Romanian connections. I got into the sport on January 1st 7:26 p.m. That was the day and time I first started to seriously run. It was like an over-night life decision. Previously in 6th grade-8th grade, we would run on track. I was always the first no matter what when we ran. It started until the end of 7th grade when I started to think about running. I trained sometimes, but not too much. In 8th grade I met a kid, who always ran as I did; first in line. He has been first in line pretty much 88/90 races. My mile was pathetic the first trimester which ended in November. I kind of waited, until I wanted to find out who is the world record mile holder. I got on youtube one night, and watched as Hicham carved into history. I was simply blown, and filled with tears at the end. A few days later I do some research on running, training, etc. And in January the first, I start. I started with running 30 minutes everyday on a treadmill, no matter the costs. My record mile was 6:50 since 7th grade, and got up to 6:55 in 8th grade. That was the last time I told myself that I would never run in the 6 minute range ever again. By March, my mile time went down to 5:50. I still lost to that kid, since he got 5:46. Towards the end, we would keep racing, and I would keep losing. After every race, I would run 12 extra laps, while every kid would be walking. I would miss class since I was spending time on the track running non-stop. We raced again in the mile, and this time, I ran a 5:38, and he got a 5:43. Then on the very last day of school, we raced again in gym class. The teachers would tell us to run 2 laps, then come back in, but at the end they let you walk and hang out. 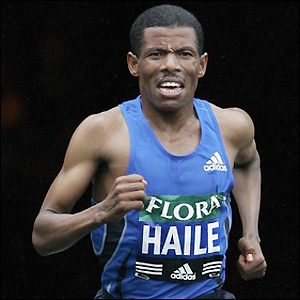 So I run 3 laps with him, until I used Hicham's tactic of going out with 600m to go. It simply crushed him, and left him with his mouth open. After I finished, I walked by him, we said farewell, and that was the end of it. I walked a couple meters right after the race, and ran 10 more laps while everyone else was walking. People said I was possessed, or insane, all kinds of name calling. Then over the summer I trained hard, very hard. So hard that I lowered the bar to a 4:55 one week before school started. My goal however, is a sub 3:40 mile. It's the first thing I thought of when I saw the mile record being a 3:43. I still want to strip Hicham of all of his other records like he did to Morceli. From what? Just seeing Said Aouita run at the Olympics on t.v. as a child. Some of my favorite music I like to listen to when I rest and run, enjoy. 1) I don't consider your goals realistic. Not because you're incapable of getting there, but because improvement rarely continues at a linear rate like that. 2) You have far too much interval work in there. Even if you cut out half of the intervals, it would be too much for most people to survive. Ok I made a few changes to my program. I need a program that is purely focused on the mile and 1500m. I took out more interval training, and put in some more "power" endurance runs. Even if 15 minutes or 30 minutes are way above the mile and you said I won't get much quality except with 400s, it still increases your lungs, circulation, and oxygen distribution. The intervals are for lactic capacity, and vo2 max. The "power" runs consist of 2 5 pound weights attached anywhere but my ankles, and it is for raising lactic power.So far I have: Lactic power, lactic capacity, aerobic power, muscular endurance, and muscular strength. I do not think I need aerobic capacity training of jogs up to 1 hour since my body is already able to run a mile non stop. The race pace should be another form of interval training, but it also trains my pace and time accuracy. I have two 21-day cycles that I go through. The first one consists of less intervals and more long distance so it is less intense. The second one high intensity parameters are added with more interval training. After the second one I just bounce right back to the first. If there is a large competition approaching like at national or international level, I do my 3rd cycle program that consists a lot of stretching, mechanics, technique, breathing, and mental training, with a few 30 minute runs here and there. From the perspective of that you are in the post--season / pre--season'2008 mode, your program is sound. However, you will have to run less and at a higher intensity, as Dan says, by March, 2008, to improve your PB's by August, 2008. You cannot damage your speed in the process: try to include some 400/800 m work--outs such as for example once a week running 400 m twice* back to back (to mention the simplest) or running 4 x 200 meters at the PB pace of the 400 meters or, even better, 8 x 100 m at a faster pace. If you follow your program, you will turn into a 1500 m / 3K / 5K specialist; if you follow your program with once a week speed workout, and will alter it by early competitive period (March, 2008), you should be able to at least keep your dash speed. *Hey Dan: I do agree that any 400 m repeat is not a pure speed repeat, but running as--fast--as--you--can two repeats of 400 m (most especially with an interval in between, but even back to back) is the closest that it comes to the pure speed work--out without actually doing a pure speed work--out. In the power workouts, after I do the 300 meter intervals, I do 30 meter uphill sprints followed by plyometric jumps at the end. Thanks about your comment on my training program, I used to do up to 15k runs in 1 hour, but I found them useless now for my distance goal times. The squats, and calf raises should add even more strength to my leg muscles for stronger stride "leaps" during a race. I am expecting to get down to at a 4:20 or 4:30 by the end of 9th grade. I will not have any major competitions during August, so there is no need to decrease my running for it. If there is a major competition coming up within 2 months, then it is ok. Also, my total weekly mileage from that program is only 28 miles. I frequently hear runners running at 60+ miles a week, but mine is 28 miles. I need to get to at least a 4:30 by the end of 9th grade, but with only 28 miles a week? I seriously cannot put in any more interval workouts, rather than increasing them to 12x400, 10x300, and 8x800 max. I also have been feeling extreme leg pain in my calves, shin muscles, a a little bit of my quads with the interval training. My calves feel torn apart ever since I tried running on the balls of my feet. It also makes me feel kind of slow like I am not covering much distance. I do not run on my toes, my feet touch the ground all the way to the beginning of my arch, around one inch lower from the toes , all I know is that my heel never touches the ground. My upward posutre feels kind of sluggish too like I am not getting any forward momentum. I try to lean forward, but there is not diffrence. Maybe increase squat weight? Ill see if I notice a change with the interval runs of 300 meters with weights. You also mentioned that I should increase my intensity from March to August. When I do the interval runs I pretty much use 100% intensity. What do you mean by "losing" speed especially while training for weeks, you speak of it as something really critical. For some reason my body is starting to fail me. Its been almost 3 weeks since my record mile of 4:48 and I do 400 meter intervals at a whooping 1:37 each, It is not that I am getting exhausted or losing strength, its that my legs are getting slower. Why? I lift my thighs up as much as I can, I "push" my body forward as much as I can, I drive my elbows harder, I bend my lower legs further back after each stride. I have been running with weights, doing plyometrics, hill runs, etc. and my speed is failing me. On the 800 meter intervals it takes me 3:14 to run, double that and thats a 6:28 mile??? Something is wrong, my 400s should be at least 1:15 or 1:10 each at training speed. Or maybe my tactical "time" pace went down, maybe use mental imagery to picture myself 10 meters ahead of me while training? And also for Dan, you said 400s should be ran at goal race pace, what about 800s? Take a couple days off each week for the next couple weeks; you are over-training! -6x300 with 10 pound torso weights. -10x20m hill runs with jog back recovery. The first 5 I do with the weights on and take 1:30 rest, then I take them off for the last 5 intervals with jog back recovery. I did that workout in the morning, and in the afternoon it boosted my 400 meter workout intervals by a load! I have found out that doing workouts as in my "power" workout, they actually workout the nervous system. If you stand in a door way and push your arms with fists closed against the sides for 1 minute as hard as you can, and then you move out of the doorway, your hands will automatically move up by themselves like they have a life of their own, like you are about to levitate. This is because the nucleus of every muscle cell in the body has a "memory." The reason the arms rise up on their own is because your muscles "remembered" to. So why was I able to run a 4;48, and 3 weeks later run a 6:28 mile? The reason was not because of fatigue or cramps, my legs just could not "move" fast. My nervous system was not able to adapt to the speed demand that I wanted, because I did not work it out. Plyometrics improve the efficiency of nervous impulses to the muscles, which allows more muscular speed. The secret is to increase this "memory" of the muscle cells for them to "remember" enough for a whole week, and thus a workout like that should be done once a week or twice a week. Speed is mostly based on nervous efficiency, and that is why people "lose" their speed , because they do not workout the nervous system. After doing 25 tuck jumps for example, then sprinting 100 meters, my legs automatically were moving, it felt like I was flying, because DIRECTLY after those jumps my leg muscles "remembered" the movement. This memory needs to be extended to at least one week in order to do other workouts like running for 30 minutes non stop more efficient at greater speed. I changed the training program again....This time during the weekend, I do long distance power runs faster than jogging, about 10 miles in an hour. During the summer I increase the time length of a long distance run to 1 hour 30 mins about 15 miles to be covered in that time non stop. I am hoping to get to an average of 90 miles a week by 10th grade most of them at a fast pace. In my first cycle, my "race pace" workouts turn to intervals of 1000m, 400m, and 800m. About over training, I never felt tired the next day just because I ran 10 miles the day before, only my muscles felt tired. I am in my second cycle so I do not have as much rest in the first cycle. It might seem like it is a marathoner's training, but its not. In my first cycle there are no race pace workouts, so it is a little bit easier. My 400s are all out sprints with adrenaline the last 200m and a direct jog back recovery without rest for 100m, then onto my second set. Every other set I jog 100 meters, and stay still for 30 seconds, then resume. For the 800s there is jog back recovery of 150m. Goal: run under 4:30 by the end of 9th grade. I have been worried lately that my mile went up, or that I can't sprint because my intervals feel slow in the afternoon, but I just ran a mile on the track in a time of 4:52 just 2 days ago, only 4 seconds slower than my personal record. I have found that on the track somehow my legs "bounce" when I run which is a relief. I do my intervals on a flat, concrete straight surface without any curves or turns. I do my long distance runs around a circular park about 272 meters around. Are intervals supposed to be ran on a straight surface? Hopefully, he'll get the hint and take his immaturity elsewhere. Intervals can be run on any surface. In general, even footing is best so it doesn't disrupt the rhythm you're trying to develop for even pacing, but straight or curved doesn't much matter unless the curves are very sharp. Thank you for the information. By the way my high school's mile record is 4:21:86 set in 1989. 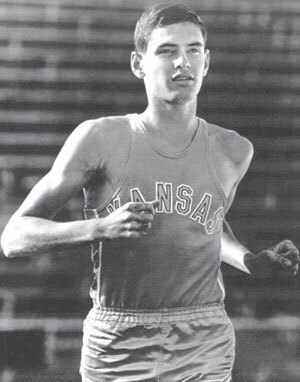 If Jim Ryun ran a sub 4 at 17, then he ran a 5 minute mile in 9th grade, and decreased by 30 seconds every year with asthma. Anyways, lately I have been abandoning ice packs, and bandages for shin splints. I do feel somewhat of a pain in my shins after 4 intense intervals, but the next day they seem fine, no more worries with shins. My cramps have gone away too as a result of the increased numebr of reps in my lower back and abdominals. I do 4x50 for lower back and abs, the next day I feel like they haven't been worked out. New sign to increase reps yet?